If you’re paying care home fees (or paying for full-time care at home) and you have health needs, you could be entitled to NHS Continuing Healthcare. Many people assume that if you have some savings or you own a property, you have to pay for your own care. How reliable is the information you have? Did you know that the NHS is obliged to pay 100% of your care home fees if you have what’s called a ‘Primary Health Need’. This means that your primary need for care is a health need – as opposed to a social care need. This funding is called NHS Continuing Healthcare. However, many of the families who contact us indicate that they have not received any accurate information about this from the health and social care authorities. Fully-funded NHS care is called NHS Continuing Healthcare. This covers 100% of care fees. Registered Nursing Care Contribution (RNCC) or Funded Nursing Care (FNC) is a weekly allowance to cover some nursing care. You should ALWAYS be assessed for NHS Continuing Healthcare BEFORE you’re assessed for FNC. If you have health needs and someone speaks to you about an ‘assessment’, make sure it’s an assessment for NHS Continuing Healthcare and not a Local Authority financial assessment. Sadly, online forums such as the Alzheimer’s Society’s Talking Point and the Parkinson’s UK forum and others show that many families feel caught between the local authority and the NHS – often pressured to undergo a financial assessment and yet trying to get through the NHS Continuing Healthcare process at the same time. Having to choose a care home, negotiate the care ‘system’, understand care fees and figure out what to do next can be very difficult, and many families feel confused and exasperated. Care To Be Different can help by showing you what should and shouldn’t happen. 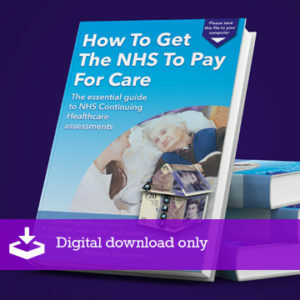 How To Get The NHS To Pay For Care is an easy-to-follow, practical e-book that helps you cut through the confusion and claim what you’re entitled to. My Dad has mixed dementia, bowel cancer and his heart is failing. He has been in hospital twice in the last few months. The first time in May he had pneumonia, renal failure, anemia and had had a heart attack. It was touch and go if he pulled through. he then went in a nursing home for rehabilitation and while he was in there he had another turn which they think was another problem with his heart. It was decided that his medical needs were more than his dementia needs and he would need to stay in a nursing home. He then ended up back in hospital with cellulitus in his hand, pneumonia and a blood clot. The Doctor was very concerned about his health especially as he needed blood thinning drugs but as they think he has a slight internal bleed with the bowel cancer its not an option long term. He is now in a permanent Nursing Home that is brilliant but he has only got funding of £150.00 a week not the full funding. They are not treating his cancer as its too advanced or his heart problems. I have been told to appeal the funding decision as his medication needs are complex now. Im also really unsure as to what they class as end of life care as in the hospital they more or less said that’s what he was going to need but in the Nursing Home they class it as advanced care and end of life care is just last few days of his life. Dad is 87. Yes I believe this is correct if you are getting or hoping to get help from Social Services but not Continuing Healthcare (CHC) they don’t have anything to do with “top up fees” as far as I know. When Social Services assess the amount of money my sister had they told me that I couldn’t use my sister’s money once she was below £23k and that when this happened I was to contact them and they would take over the funding but she would need to move to cheaper care home and at this point they said that any top up would have to come from me. I desperately tried to keep my sister in the care home she had been in for 7 years, with getting help from various places thankfully we managed to survive the year, whilst I fought the CHC funding decision without getting Social Services involved, which was such a relief as once she had lost her room it would have been very difficult to have got it back! Hi my Mum went into a care home last year she is 94 , had lots of problems before with falls etc she has heart failure & vascular dementia, we have sold her flat and paying over £2000 a month for her care in home, which was going great & she loved it . then 3 weeks ago she had 2 strokes one after the other and has been in hospital since quite poorly and i do not think she will be coming out soon !. Obviously still paying for her room etc as I would hope she would go back when recovered, but last time after her 1st stroke last year she was in hospital for 3 months , is there any help with paying her fees whilst she isn’t there ? . As she has only got enough money for 2 years in the home as it is. Could someone help me, we after a very long stressful year won the battle for CHC funding and after another three month have been repaid the monies paid out for my sister’s care home fees. I have now had an email from the care home saying that CHC have now taken back over £8000 for the Funded Nursing Care (FNC) which CHC paid the care home during the year that my sister was self funding, when my sister was refused CHC funding (even though she had been funding for quite a few years prior to this last eligibility meeting) in the letter they sent it says: “your sister’s needs do however meet the department of health criteria for FNC and NHS Clinical Commissioning Group will pay £112.00 per week contribution direct to the nursing home whilst she is registered with the county GP”, they didn’t mention that this money needs to be paid back once CHC have been proved that they made an awful error in the first place. When we were billed each month from the care home the price was of course minus the FNC, so when we had to bill CHC FNC money were not mentioned we only claimed back what was paid out. However we were told the price the care home charged and with the FNC the price was lowered. Do we need to now pay the care home back the money the CHC has taken from the care home? Thanks Angela but this doesn’t say who we have to instruct to carry out the initial assessment? Mum is in Bedfordshire, who do we actually have to ask to start an assessment off, or is it worth waiting until she ticks more boxes? Confused. In the article link, scroll to the section with the subheading: ‘Getting the NHS Continuing Healthcare assessment process started’, and see the first few short paragraphs under that subheading. We’ve also added an extra paragraph and an extra link there to help make it clearer. I am a little confused. Who does the initial assessment ? How do we arrange for it to be started, do we call local Social Services? My mum is currently in a care home, self funded, has early onset dementia, and the home keep putting up the fees. Pretty sure she has never been assessed – I’ve looked at the checklist, I think she might only meet one of the tick boxes, so possibly not enough , but could be more – who gets the ball rolling with who ? Who do we contact ? My husband who is 79 years old, has been in hospital for over two weeks suffering with advance dementia and prostate cancer. He had a check list which did not benefit him, therefore the social worker helped me find a private residential care home for him. Because he has savings over 28, 000 and is still paying mortgage for a one bed flat they classed him as self funding and he has to pay 750 a week . But yesterday a man from social services phoned to ask about his financial asset in view to send us a financial assessment form to be filled out. In which case i mentioned that he was self funding– he acted very surprise and backed down. Can I still apply for NHS healthcare for him? Norma – if the Checklist you mentioned was a Continuing Healthcare Checklist, and if you weren’t present and/or you disagree with the outcome, you can appeal and ask for it to be done again. You asked whether you can still apply for Continuing Healthcare at this point. Yes, you can. Take a look at the links in my reply to Janet here. My mother has been receiving chc for 12 months as a palative care patient with cancer she recently fell and broke her hip which has now resulted in her being bed bound double incontinent and never gets out of the hospital bed in her room at home. She owns her house and has carers 4 times a day and we are now thinking about a care home for 24/7 care. She will be reviewed in Feb 2017, Social Services have been on the phone a couple of times (they have never been in contact before now) telling me that if she owns her own house it will be sold and that she could keep 23,000 it sounds like a decision already made! In view of the last 12 months and the fact that she is in a worse state of health district nurses are coming in every week, is there anything i should be looking into before this review takes place. There is someone i know who sold their home for 350k and are in a nursing home; they have full capacity of brain and arms. The only thing that is wrong with them is poor mobility with legs, needs help walking and weak bladder. Plus his age 89 and they get there benefits do they have to pay for their care in the nursing home and are they allowed to have chc. I dont think they have told the local althority about the money can anyone give advice? Sue – the only way to know if the person would be eligible for Continuing Healthcare (CHC) is for the CHC assessment process to be carried out: http://caretobedifferent.co.uk/getting-the-nhs-continuing-healthcare-assessment-process-started/ This is the first thing that should happen; means testing and paying for care is strictly secondary. Can you please advise in the case of my Mother who has just turned 100 years old. She has been in a care home for over 10 years, self-funded. Over the past few years her condition has deteriorated and I have repeatedly requested funding through the NHS, both in the form of a retrospective appeal (she fell and broke her hip, had surgery and was returned to the care home in very poor health, she almost died and the care home manager arranged to set up a syringe driver, fortunately she recovered, but she should never have been dismissed from the hospital in that condition). That appeal failed and although I have nor further information to further the case, I am still appealing against it because I believe the panel are brushing aside the facts. I also request NHS assessments, but on every occasion my Mother fails the test. It is impossible to understand this – she is immobile, has dementia, and cancer, cannot communicate and is doubly incontinent. The care home is not very helpful in these appeals, presumably because as a self-funder she is paying higher fees. It is difficult to comprehend how much worse things can get for her whilst still alive. Strictly speaking she does not warrant ‘nursing’ – her medication is administered by senior staff, she has visits from district nurses who check her for bed sores – although she sleeps in her bed very infrequently, she spends most nights in a chair in the sitting room – and her GP visits as and when necessary. The local MP has been instrumental in moving things along more speedily, but it is difficult to see how she can be more pro-active. Where do I go next without spending costly legal fees? I would insist on a Continuing Healthcare (CHC) assessment – by the social worker/health professional and be present at that assessment so you can ensure her needs are promoted and she gets the best chance of funding. If her needs are complex enough she would not have to pay her fees for care home etc, but I am not expert and reseach is also a good idea, check out the advice Care To Be Different offers to others and read the web links as information/knowledge about funding eligibility is really important – as there are those out there whose priority is not about funding the required care provision but saving money. My experience was that the assessments undertaken were financial and a basic needs assessment but no CHC assesment was undertaken for my mother and we are now trying to reclaim years worth of care home fees via a solicitor. You could also look for a copy of the assesment paperwork on the web so you are prepared before the assessment takes place. We are stuck in a bit of a situation at the moment where my nan has gone into Hospital 3 weeks ago with pneumonia and massive water infection on her legs. She was walking round the day before and overnight when taken in became completely immobile and really bad memory loss. She owns her house but only as my mother (who is her daughter in law) has paid a mortgage over 20 years to keep a roof over her head and it still has 4 years left. My father is next to useless in this situation and I’m really worried nothing is being prepared and my mother is potentially going to lose the house she has paid for as it’s still in my nan’s name. Have you any advise on what we need to do with regards to care as I am having to step in myself for my nan’s sake and I have no idea what we need to do? My mother was assessed and given 100%continuing health care.Yet she had to pay for personal care in a nursing home.She was transfered from hospital to a continuing care bed in a nursing home.Should she have had to pay. I would like some advice. My aunt has not qualified for the CHC funding- I find this very strange and not 100% sure if this has correctly being assessed. The CCG awarded Funded Nursing Care (FNC), and local Social Services has both been approved and will be given an allowance £530. However the nursing home they have suggested to us is more than the approved fund. They are asking us to top up the remaining £500 a week. My parent do not have enough to help with the top up even if they borrowed money. My aunt has no property, savings or children. How can we get more funding from the local council? Or could we request another assessment for CHC? We have asked for a list of other home that are cheaper as an alternative option. Hello, could any one help? My Grandfather suffers from Alzheimer’s, which as been deemed as mild – this has been the case for 7 years. He also has stents and suffers from severe headaches. He has had a number of severe falls at home and has macular degeneration in his eyes. He also has prostrate cancer. He lives at home alone and is cared for by my father. He has now been admitted to hospital as over a week ago he had what can only be described as a bizarre turn where he woke up and was completely confused and delirious. He was taken in to hospital and has been there under ‘assessment’ ever since. Many tests have been carried out and all results have shown no reason for this decline other than a possible sodium deficiency. Our worry is that he is discharged to go home and the care again falls on the shoulders of my father. It seems he is in completely the wrong place being on a ward when he is so confused and he seems to have been kept there for so long with no clear compressive plan. Should he be assessed for CHC before leaving hospital. Is he entitled to care funded by the government? He has had some care in the past from social services – the odd visit from a carer etc which he paid extortionate rates for. Our feeling is that he has a medical conditions so should possibly be cared fro by the NHS. Any advice would be greatly appreciated? Initially after the urgent care centre admitted him for UTI distended stomach and the incontinence and the fact he could no longer walk . He had 2 lots of IV antibiotics and his confusion has reduced so we assume that the UTI was partly to blame for his increasing confusion . The incontinence was not evident but a week later they decided he was constipated . He then had a day of very bad incontinence . We had to bring home 2 pairs of heavily soiled trousers . On one occasion during visiting he brought his hand up from the bed covered in faeces whilst my sister was there . The hospital records are unclear about the continence . His leg finally has been diagnosed as acute osteo arthritis . Since being in hospital for nearly 2 weeks he has been very immobile – yesterday to get him into a wheelchair needed a nurse and a machine to transfer him . He has since being in hospital got a pressure sore blister on his heel – from where they allowed him to sit with slippers on and a moisture lesion on his bottom . In addition Dad is insisting in sleeping in his clothes , hence the messed trousers probably . He also needs cream applying 3 times a day in his groin . He was not doing this himself before he went on holiday . I have looked at the daily record sheets and the incontinence is not being recording correctly and we see this as a major health need which needs clinical input until it is managed . I would be very grateful for any advice on what to do next . My sister and I are dreading him being discharged and not being given help to get as well as possible and return to his home which is what we all want. My uncle has vascular dementia after a number of mini strokes, he can not walk or speak, has no comprehension left and is incontinent. He is unable to communicate or do anything for himself- to the point now where he does not even put a sweet in his mouth if you put it in his hand. He has had treatment for a bladder cancer, a quadruple heart bypass and has kidney problems. He has been in a care home for 4 years. He receives a payment towards nursing care but was assessed for CHC and I was told he does not qualify as his needs are for social care. He pays his whole care home fees- or I do from his savings as I have Lasting Power of Attorney for him. It seems unbelieveable to me that he does not qualify for CHC. My Partners mum has just been given the fast track CHC but the NHS are saying we can only chose a home from a recommended NHS list? I cant find reference to this anywhere? I suspect the list comprises the very cheapest homes, Gavin. If there’s a care home you’d prefer your partner’s mum to go to, you could ask the manager at that home whether they have – or have had – Continuing Healthcare funded residents. If they have, go back to the NHS and tell them that’s the home you’ve chosen (assuming there are places, of course). Also, keep in mind that your partner’s mum must be in a home that can manage all her care needs. If the ones on the NHS list are indeed the cheapest, they may (potentially) not able to provide care required, and this could give you another argument in your favour. My brother has been in a care home for the past 7 years. He has mental health and care problems. He was sectioned into the home and is funded by nhs continuing care. He has savings, receives a state pension and has just received a modest pension lump sum. Should he be contributing to his care? Robert – your brother’s money has nothing to do with his potential eligibility for Continuing Healthcare funding; any decision about funding is based on his care needs only, not his money. As he is receiving Continuing Healthcare , he does not have to pay anything towards his care. I found my local CHC office really helpful when the same happened to our family and CHC advised us if the home sent any bills to us then to direct them (the home) to CHC. I also contacted the home and advised them that to my knowledge top ups were illegal – unless my mother was getting a ‘special’ room with en-suite or other extras, which she wasn’t. The top up invoices stopped after this. I understand that if you have had a contract previously with the home to provide top up that may complicate things. We were topping up but had no contract, if I had known then what I know now I would have challenged any top up prior to CHC being awarded. The information on this website has been really helpful in me having the confidence to challenge the home and the local authority as they seem to rely on people being really passive. Thanks for your kind words about the website, Mike – I’m glad it’s helpful. Well done for challenging the top ups. My mum lives in a private care home she has Alzheimer’s, we have been paying for all her care until the beginning of March when she got fully funded Continuing Healthcare (CHC). Today we received a bill from the care home asking for a top up every week saying they are not receiving enough to pay for her care from CHC. Are they allowed to do this? I’ve read that it is illegal but just wanted to double check that this is the case. I am a carer for my brothers sister for over 30 years. Her condition has become really bad in the recent years. She has mental illness but suffers from Chronic Rheumatoid Arthritis. There is nothing that they can do to help her mobility and pain now as she had reached the last stages. Recently the situation has been getting worse and losing bowel control. I can no longer look after her any more and would to put her in a care home.I cannot afford to pay for a home privately myself. She has no saving, no property just the funding from the government for her needs. How can I start the process of getting her into a care home paid by the NHS? My social worker shut me down straight away and said basically it won’t happen and there is no chance them paying for it or contributing. I feel so upset by this and don’t know how much longer I can continue the care. Dee – the social worker is completely wrong to tell you not to bother and to put you off. Sadly, this happens so many times. The GP can refer her, yes, but the social worker also has a duty to abide by the Care Act and refer her for Continuing Healthcare (CHC) funding assessment. Indeed, the social worker can carry out the first stage of this assessment – the Checklist. Take a look at the links in the following responses, as they will help you get started. Thank you for the information and reference to the National framework. It has been invaluable in ensuring I felt confident in seeking social work and CHC team support in challenging these demands for top up.It beggars belief that owners or managers of care homes dont know that this is covered by legislation. Regarding my mother’s funding she has now had her three month review under CHC and is awaiting the decision going back to panel for agreement – although at the review meeting it was said by the assessor that her needs still met the criteria for funding . However we were advised by her that the Panel may ask for further evidence to support the decision (as they did at the initial assessment). You’re right, Mike. The lack of knowledge – and training – amongst care staff is woeful, disgraceful and completely unacceptable. Wishing you well with the review. My mother has been assessed for CHC funding and this has been agreed for an initial three months .My elderly father has received top up bills totalling about 1700 Pounds for the period that she has been accepted for chc funding. When I challenged the care provider about these bills they said they were valid and that others in their homes who receive CHC funding pay a top up. I want to challenge this properly – what law does this top up request contravene. What you’ve been told is not correct, Mike. It’s illegal for the NHS to ask for top ups with CHC. If the CHC payments are not enough for the care provider, that’s a matter between them and the NHS, and neither party should come to the family for more money. 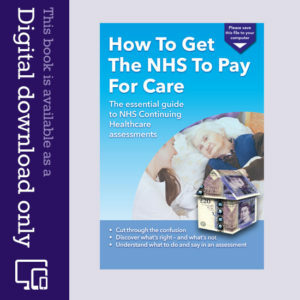 See National Framework page 118, paragraph 99.3: “Topping up… is not permissible under NHS legislation.” https://www.gov.uk/government/uploads/system/uploads/attachment_data/file/213137/National-Framework-for-NHS-CHC-NHS-FNC-Nov-2012.pdf Also, you mentioned that CHC has been agree for your mother for three months. There’s a subtle difference between that and what is actually the case with CHC: CHC has been awarded to your mother for as long as she needs it. Simple as that. There’s no time limit on how long she can receive it if she meets the criteria. In three month’s time there will be a review – just to see if anything’s changed – and it is ONLY if your mother’s needs have genuinely reduced below the eligibility threshold that that anyone should suggest removing the funding. If my Mother gets Continuing Healthcare to fully fund a nursing home place we are told we can’t choose the home. She could go to the lowest bidder! If she gets full funding, can relatives pay a contribution for a slightly more expensive nursing home or does that only apply to people who don’t qualify for fully funded nursing care? You can’t top up NHS Continuing Healthcare – and no one should ask you to. It’s illegal for NHS care to be topped up. The funding must cover all assessed care needs – whatever those needs are. There is no cap on Continuing Healthcare. 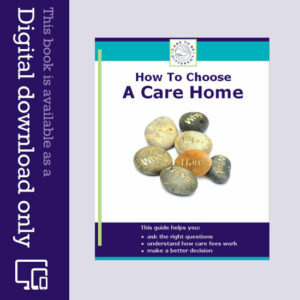 You do have choice about care homes – and you mother’s care should certainly not be put out to the lowest bidder. When you visit care homes, find out if they have – or have had – residents who receive NHS Continuing Healthcare. If they do, the CCG can’t argue they are too expensive. We have been told my mother will get full CHC funding for a nursing home place. She jointly owns a house with my father, where he still lives. If he has to move out of the house to meet his own care needs, would he be forced to sell it to pay back the CHC funding as well as his own care fees? CHC funding does not have to be paid back and it is is not means tested. Your father would need to be assessed for NHS Continuing Healthcare in his own right, should he need care, and it is only ever if a person is NOT eligible for CHC that they should ever been means tested. Also, no one should be told to pay for someone else’s care – only for their own care. Am I entitled to local authority funding to help with community support ie shopping leisure activities etc if I have 100% continuing health care funding? Continuing Healthcare funding covers all assessed needs, including assessed social care needs so, to answer your question, it would depend on your situation and what has been assessed as social care needs. My father was discharged from hospital into a CAP bed in a local care home (Complex Assesment Pathway). He has had two DST assessments and we have not been given the results from either. They said he wasn’t in “optimum” health both times. He has been there 16 weeks now. At the last assessment meeting we were told we could look for a permanent care home on a “recommendation” and his place would be funded 50-50 with Social Services. Yesterday I informed Social Worker of the home we have decided upon and was told that dad needs a financial assessment as the Social Services 50% is means tested. I was staggered by this as I understand he should not receive a financial assessment until his care needs have been decided via the DST. She said she had been informed by Continuing Healthcare team that once in new home he would have another DST after six weeks. Is this right procedure and if not what can we do? Hi Val – it sounds as though the Continuing Healthcare (CHC) process has not been followed correctly by the assessors. You should have a copy of any DST that has been completed and have been fully involved in the assessments. Unless it’s clear that the correct decision-making process as been followed, with clear written notes, etc, the statement that your father will receive 50-50 funding can be challenged. No one should be asking for financial information until the proper process has been followed and a lawful funding decision made. Make a complaint in writing to the CHC team and copy it to the Head of Adult Care (and everyone else involved), stating that the local authority is now potentially in an unlawful position in attempting to charge for care before it has been properly established that they have a legal right to. Thank you Angela. We have complained to the CEO of CHC but got quite a lame reply which said he was assessed too early. However he has been there 16 weeks now and already had two! He has been having frequent UTIs as he has a permanent catheter so we doubt he will ever be ‘optimum’. He also has Dementia. How long are they allowed to wait as I thought it was supposed to be 28 days to the DST and decision? They seem to be using this term ‘optimum’ to delay matters. We have also contacted dads MP to see if she can help. Will try contacting Social Services re the unlawful angle. We are getting very frustrated and feel we have tried everything to get this sorted. Do you think we need to involve a solicitor? The new Care Act requires a person to be properly considered for CHC before anything else. When you contact Social Services, you may want to remind them of their duty in that respect. If you need one-to-one help, I may be able to put you in touch with someone. You can send a message via the contact form on this website. My mother is currently self funded in a private care home. We have applied for CHC (NHS) to start funding and we are going through the procedure to assess her care needs. We pay £550 per month now. If the assessment goes in her favour and the NHS start to fund her care, will the NHS pay the same amount to the care home, that is being currently paid now (£550) per month ? I’ve kind of been told that private fees and what the NHS pay the homes per month, is significantly different. Can anyone advise from their own experiences ?